The Take a Friend/Go Snowmobiling campaign is pleased to present a new addition to its list of ready to use snowmobiling campaign material. 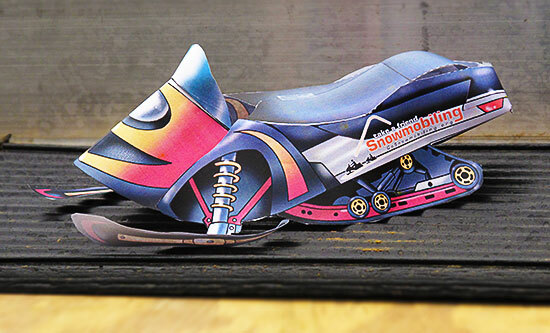 Introduced at shows in North America, this snowmobile cut-out paper model was originally created for children at the shows and safety training programs held throughout North America. It was discovered that not only children and young snowmobilers enjoy printing and assembling the paper snowmobile, but adults of all ages jumped into the mix and participated in snowmobile contests at shows. The attached snowmobile cut-out, with assembly instructions, is easy to distribute electronically and can be used to liven up table decorations at functions, classrooms, etc. The paper snowmobiles can be assembled quickly. The sledmass test facility were able to piece it together in about 30 minutes. We didn’t have any glue in the house but tape worked just fine. The concept and the artwork was created for the Go Snowmobiling Campaign by our poster artist, the wonderful Robert Van Nood. Robert is the artist behind the ISMA Safe Riders! poster series. His creative genius is recognized not only in the snowmobile business but in other Power Sports industries and outdoor recreation activities worldwide. The first ISMA poster “Snowmobiling and Alcohol don’t mix / Don’t Drink and Ride” was created for ISMA in 1996 by Robert Van Nood. His artistic skills continue to provide us with fun, educational and promotional tools to help support snowmobiling. Please print off a few copies of the paper snowmobile and send us your thoughts on our newest addition to the Go Snowmobiling collateral material. You can send us pictures on www.Facebook.com/GoSnowmobiling to highlight how you are using the cut-out in your club and association events. We encourage you to send this fun piece to your members, local media and place it on your web sites. The snowmobile cut-outs are also available on our websites: www.snowmobile.org and www.gosnowmobiling.org.